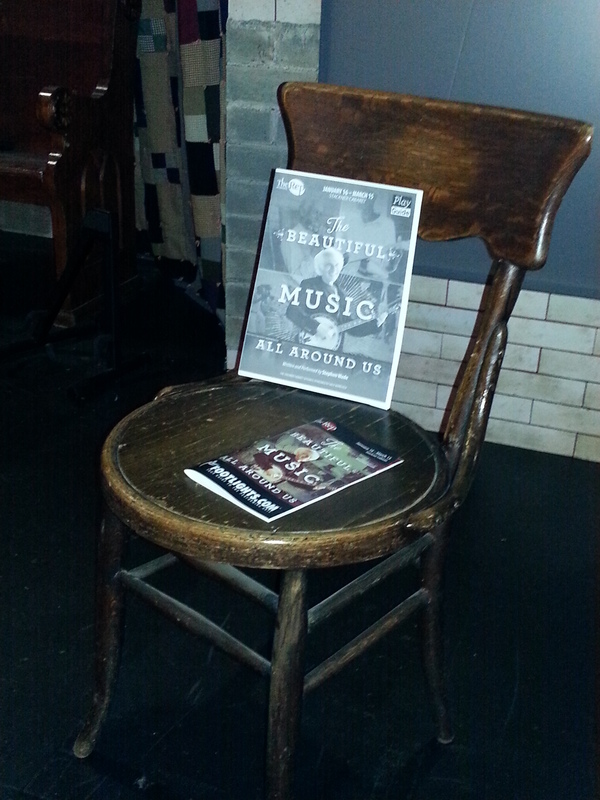 I also want to write about Stephen Wade’s “The Beautiful Music All Around Us.” Sweetheart and I saw and heard him last week at our local Repertory Theater*. But I want to hold off until I have acquired and read his book. He didn’t have any at his show, which was Wade telling great stories about the American folk music gathered by people like John Lomax, and singing the songs Lomax and others gathered. As a young performer, Wade went looking for – and found – many of those people, and he stayed in their lives. So the stories he told were personal, but had long reach, because so many of the songs were old friends. Also, Wade is an astonishing performer. I am sure he and Steve Martin have seen each other’s living rooms more than once. But enough with the dazzling artistry. On to flights of fancy. Specifically, imagining myself as one of the Real Beekeepers of Flyover Country, sought after by tabloid reporters craving Beekeeper drama. At that point, the fantasy falls apart. No one gets drunk, no chairs are thrown, no one goes to jail and the closest thing to couture is my tumbling composter. There’s a backyard and a beehive. The closest thing to drama is that my friend Jeff, who had one of his nine hives in our back yard for two years, moved to Colorado last fall, leaving me bereft. I loved watching the bees, and that actual honey came out of the hive was a surreal thrill. So, Jeff said he’d leave me enough to get started beekeeping. Evidently, frame quantity is an individual preference. Some beekeepers think the 8 frame hives are easier to work and generate more honey. My agenda is more about beewatching and less about honey yield. So my main interest in knowing which kind Jeff left me was so I’d know what to order when I get around to ordering. Which I need to do before my two pounds of bees and their queen show up, sometime in May. I knew there were no bees in the hive when I went out to open it up this past weekend, because I’d opened it earlier in the week. I learned in my Beginning Beekeeping Workshop that you don’t want to open a hive unless it’s warmer than 45 degrees Fahrenheit (about 8 for you Celsius types). If I’d been thinking more about what Andy had told us in the workshop, I would have known without opening the hive. One hive box in Flyover Country is a death sentence for wintering bees. In the south, one is enough. But in colder climates, you need two for the bees to even have a chance at survival. They keep warm by clustering in a huddle and beating their wings to generate heat. Which takes energy. Which requires eating. Adult bees eat honey, which is why beekeepers don’t harvest the honey from hive boxes. Harvested honey comes from shallower boxes that go on top of the hive boxes. They’re called “supers.” The term seems to be related to their position on the hive. In order to work a hive, you also need a smoker. A smoker is a strange-looking contraption that looks like a very small prototype of a tin man torso wearing a hat, with a bellows attached to one side of it. Bees communicate through pheromones, so you light the smoker and then use the bellows to blow a puff of smoke into the hive. It interrupts the pheromone flow (kind of like a bee version of unplugging your router) and the bees – from what I hear – stumble around in a kind of stoned daze, forgetting they’re supposed to attack. That’s when you can check the hive and make sure there are baby bees and no nasty invaders – hive beetles, varroa mites, tracheal mites or wax moths. Sometimes mice try to settle in. You do not want mice in your beehive. As of yesterday, I have a vintage smoker to go with my vintage bee veil. It came from e-bay. The price was right, and it looked like it was in good condition. Most important, the cat approved. 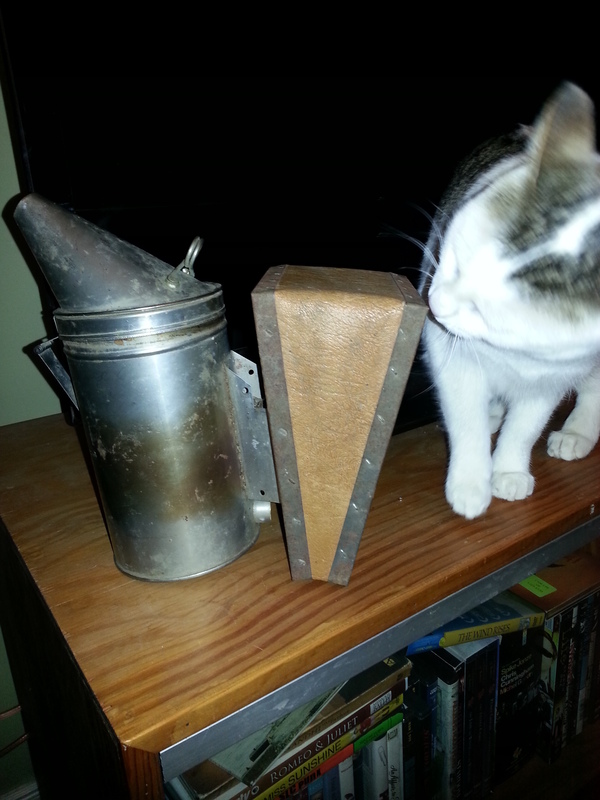 Feline quality control inspector Betty checks out the bee smoker. *A special thanks to my wonderful friend Jimmy for the tix.